How can wheel alignment benefit your fleet operation? The number one and two operating expenses in over-the-road transportation are fuel and tires respectively. Both are typically perceived as hard to control. Routine wheel alignment is the most effective way to control tire costs and can impact fuel costs as well. 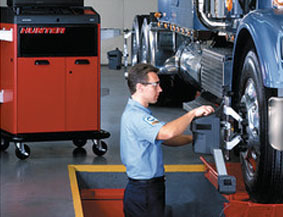 Between 70 and 80 percent of heavy duty vehicles on the road today are misaligned. The transportation industry, as a whole, finds that outsourcing timely, accurate alignment service performed by qualified technicians is difficult to manage. As a result alignment is mostly addressed after the damage has been done. Simply making alignment part of a vehicle or fleet preventive maintenance program allows operators to easily get a handle on this perceived uncontrollable expense. We can help you manage your Alignment Preventive Maintenance Program. On time, accurate and qualified. Hunter Engineering recommends a minimum of two to three alignments per year or every 50,000 to 60,000 miles as part of the average vehicle?s preventive maintenance program.